Contact Manager is a web-based CRM system, which provides integration of all communication channels in a company. The CRM main feature is to save and organize all contacts information that is entered by phone, e-mail, web-site, or is personally set up by an employee and displayed in the client‘s profile. 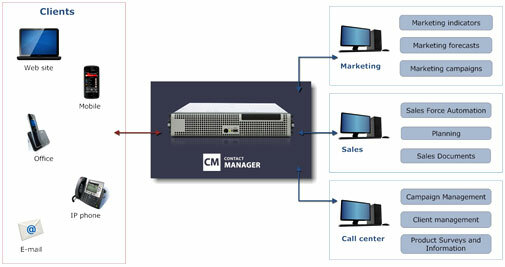 Contact Manager can be effectively used for the purposes of the marketing and sales departments in the company. Contact Manager includes 3 modules – e-mail organizer, online help-desk, call-manager, which can be provided together or separately. Do you use your web-site as an interactive communication tool with your clients? Online help desk links the company web-site (inquire form/s and/or online chat communication) with the client database and thus it becomes a powerful and easy communication channel. Analysis for service of the clients – time to service, satisfaction, etc. 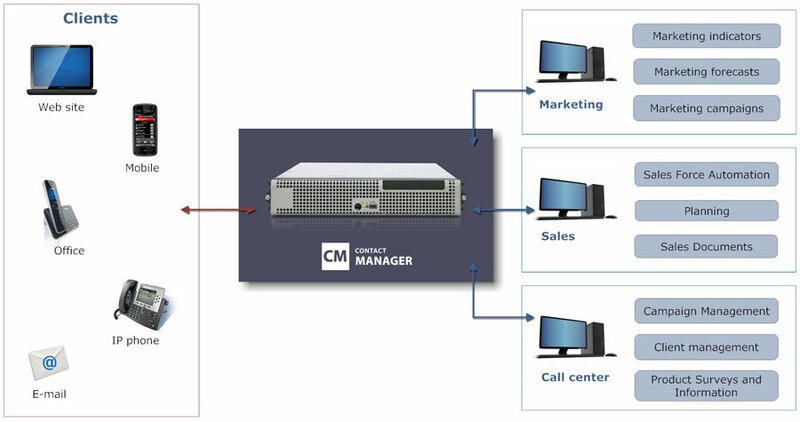 Call Manager is the module that process, navigates, monitor and save all calls in the company. It combines a corporate call-center upgraded with the special CM software that gives a lot of new opportunities for optimizing your business and growing your revenues. You want to extend the Contact Manager in a customer centric ERP system – we can provide and integrate it in your business. We have done it in Medical, Marketing, Logistic, etc.